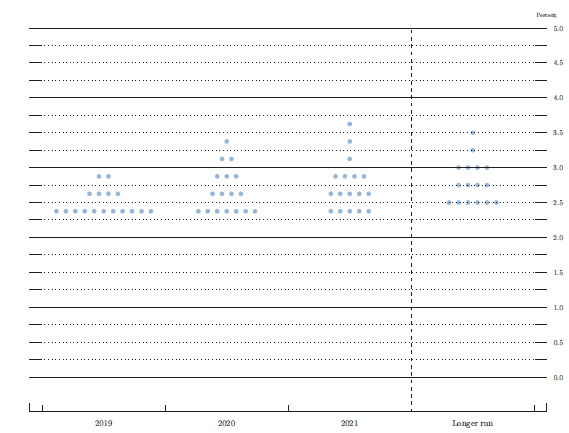 The Federal Reserve 'Dot Plot' signaled no more increase in interest rates in 2019 and just one in 2020. The Fed still sees rates peaking at 2.8%, but not until after 2021. Information received since the Federal Open Market Committee met in January indicates that the labor market remains strong but that growth of economic activity has slowed from its solid rate in the fourth quarter. Payroll employment was little changed in February, but job gains have been solid, on average, in recent months, and the unemployment rate has remained low. Recent indicators point to slower growth of household spending and business fixed investment in the first quarter. On a 12-month basis, overall inflation has declined, largely as a result of lower energy prices; inflation for items other than food and energy remains near 2 percent. On balance, market-based measures of inflation compensation have remained low in recent months, and survey-based measures of longer-term inflation expectations are little changed. Consistent with its statutory mandate, the Committee seeks to foster maximum employment and price stability. 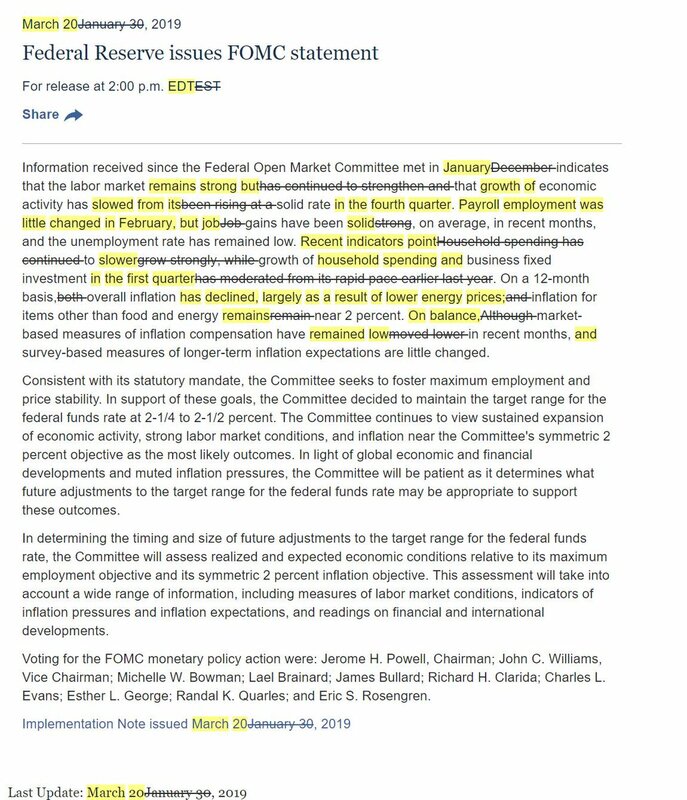 In support of these goals, the Committee decided to maintain the target range for the federal funds rate at 2-1/4 to 2-1/2 percent. The Committee continues to view sustained expansion of economic activity, strong labor market conditions, and inflation near the Committee's symmetric 2 percent objective as the most likely outcomes. In light of global economic and financial developments and muted inflation pressures, the Committee will be patient as it determines what future adjustments to the target range for the federal funds rate may be appropriate to support these outcomes. Discuss this article in the forums (7 replies).